Are you looking for the PERFECT Cheerleading Gifts this holiday or cheerleading season? 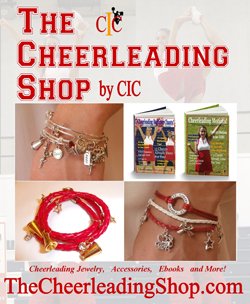 Check out the HUGE Selection of cheerleading jewerly and gifts, dance jewelry and gymnastics jewelry at TheCheerleadingShop.com. We are LOVING this gorgeous, cheer fashion statement with several bracelets stacked together! This picture includes a cheerleading stretch bead bracelet, the cheerleading leather wrap charm bracelet and a cheer charm bangle bracelet that can be dated 2016 or 2017! How will you stack your spirit this holiday? Place Your Team Orders NOW to Guarantee to the PERFECT Gift for Your Cheerleaders! Are you looking for the perfect gifts for your cheerleaders for homecoming, competition or the holidays? NOW is the perfect time to order CUSTOM bracelets for your team so you can have the perfect, inspirational and memorable gifts for your cheerleaders! For all of the details and TEAM DISCOUNTS, check out The Cheerleading Shop or contact us at Info@AmericasLeaders.net. This beautiful gold tone, adjustable bracelet highlights the word "cheerleader" on the front and has the phrase "Live Your Dreams" engraved on the back to inspire you. It is perfect to wear alone or stack it with more charm bracelets for a fashionable cuff look. This is a LIMITED RELEASE so get yours today at TheCheerleadingShop.com, remember they make GREAT GIFTS too! Ok, we are SO EXCITED about what we have in store for YOU this year here on CIC! We have SO MANY outstanding programs, tips and tools to make sure you reach your Cheer Goals, Coaching Goals and MORE!!! If you would be so kind to give us YOUR OPINION by filling out this FUN CIC SURVEY, as we want to make sure we include your needs in our new roll out this Fall. As we would be so grateful for your time, everyone that fills out this FUN CIC SURVEY, will be entered to win this GORGEOUS Cheerleading Bracelet Bangle Stack from TheCheerleadingShop.com. Would you like to join an Outstanding Team of People that will help YOU reach your goals? Would you love some GREAT EXPERIENCE for your resume? Or would you just LOVE some EXTRA MONEY and Make Money with Cheerleading? We are currently taking applications for our CIC Financial Independence Team! 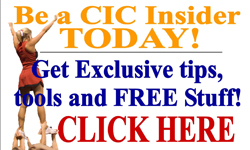 So if you are looking to make a little extra money on the side or start your own business, CIC has an opportunity for you. If you are a cheerleader, dancer, Team Mom or Coach, we would love to help you reach your goals.